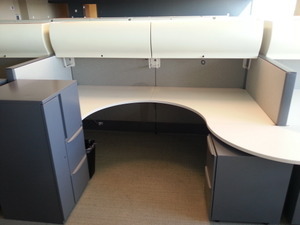 These Haworth Premise cubicles are a hot item. We will be pushing this product out the door very quickly so act now if you are interested. These office cubicles are 8×6 with 48″ high panels with power receptacles along the spine wall. Each used cubicles has two up mounted over head storage bins with task lights, one storage cabinet and one mobile file file cabinet. Chat online today to secure these cubicles.